Calling all campers! Are you ready to find out what’s behind the yellow sign? 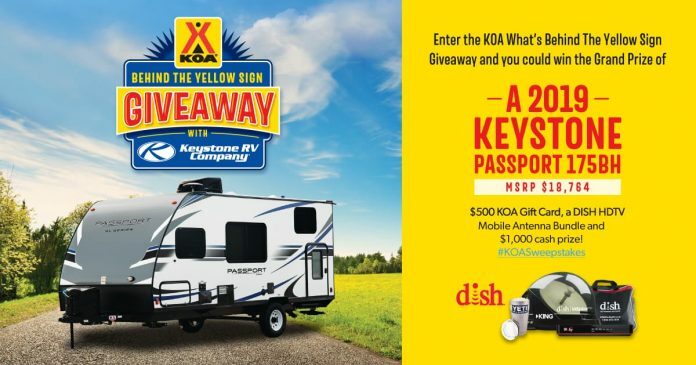 North America’s largest network of campgrounds KOA and Keystone RV Company, the #1 manufacturer of fifth wheel recreational vehicles in North America, are teaming up to give one lucky camping lover the chance to win the KOA What’s Behind The Yellow Sign Giveaway 2019. Enter online at BehindTheSignGiveaway.com now and this year, you could win a Keystone Passport 175BH valued at $19,800. Grand prize winner will also receive a $500 KOA Gift Card to be used at all KOA’s across North America and a cash prize of $1,000. For your chance to win, visit either the Giveaway page at behindthesigngiveaway.com or KOA Facebook page now through May 31, 2019 and register for the KOA What’s Behind the Yellow Sign Giveaway 2019. Want more chances to win? Simply share the Giveaway on Facebook and/or Twitter using the provided buttons on the “Thank You” page to get started. The KOA What’s Behind the Yellow Sign Giveaway 2019 is open only to legal residents of the United States, the District of Columbia (excluding Hawaii and Alaska), and Canada (excluding Quebec) who are 18 years of age or older and located in the U.S. or Canada at the time of entry. I would like to go traveling with this neat looking trailer. My best childhood memories is camping. From Maine to the Great Smokey Mountains.This is on my bucket list of bringing back my childhood memories and just loving life with this fantastic camper.